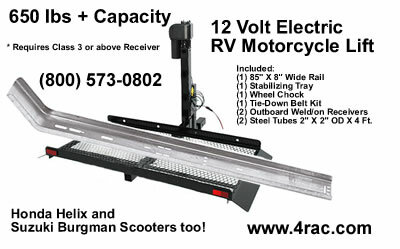 Motorcycle Trailer Hitches 0Call the "Towing Experts"
Open 7 days a week 'till Midnight! *Need a New Trailer? We have Pull behind trailers too! "Click Here"
* "Scroll Down" for Search! TMC e-Store Questions? - Call our Technical Support Guys, available untill Midnight! To Protect Your bike's L.E.D. and Computer you may need a "Wiring Converter" for connection to trailer wiring! 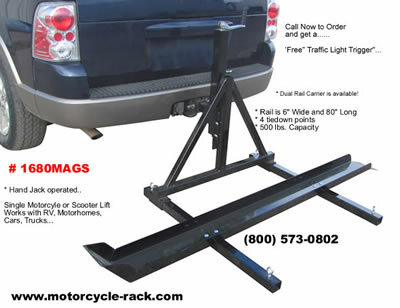 DenRay motorcycle trailer hitches * Call to see if we have a special on your Hitch today! Click Here HitchDoc Products! e-mail us: For a picture with installation info, Sale Price & Freight Quote! * Special Year end Pricing and deals! 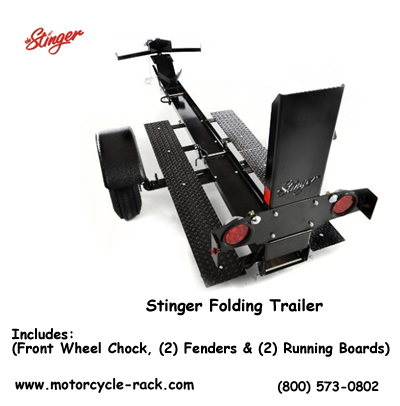 "Click on the picture below" to see our "Stinger" Folding Motorcycle & Can-Am "Spyder" trailers! "Click on the picture below" to see our Tow behind a motorcycle trailer! "Click on the picture below" to see our "Electric Motorcycle & Scooter lift! "Click on the picture below" to see our "Manual Motorcyce & Scooter lift! We sell Den-Ray motorcycle trailer hitches, they are the Canadian manufacturer leader in the industry of motorcycle trailer hitches and cargo trailers. We have developed over 200 models and have over 1000 hitches in stock ready to ship. Easy to install, and available in different styles, such as hidden, conventional, chrome fender, etc. Made in our factory, these hitches are developed directly on motorcycles. We also can supply a "Classic" motorcycle trailer hitch for Most Motorcycle Brands used in the U.S.A.
Hitches for Harleys from 1969 and newer to fit most models. Hitches are available in Black Powder coating or chrome plated with finished welds..
All the welds on Our motorcycle trailer hitches are ground and polished. Installation is easy because there is no drilling on most bikes. Denray is now a trade mark synonym of quality in the industry of hitches and cargo trailers for motorcycles. In business for over 25 years, Denray can recognize motorcyclist’s needs. We have had several products and services to the business.We convert motorcycles in trikes according to your specific needs. We also have few demo trikes in our 2500 square feet showroom. We have chosen one of the most important American trikes manufacturers, California SideCar. Our garage will satisfy the most exigent. Repairs, maintenance, performance and customizing are the mechanic services offered. Our technicians will be equal to your expecting and will offer you a personalized service. Denray bought an important competitor in the industry of cargo trailers, which is Aero Trailers. The after-market and production of the Aero and Denray trailers will be done at the same place. Our commitment is to offer you a courteous and rapid customized service for motorcycle trailer hitches. Motorcycle enthusiasts are famous for enjoying long rides on their bikes. But a long trip can also cause some problems. Motorcycles don't have a lot of carrying capacity. Traveling without a trunk or a back seat to carry your gear can make a trip more more difficult. That's where a motorcycle trailer hitch and trailer comes in handy. A motorcycle trailer hitch will allow you to hook a trailer up to your bike and haul the things you'll need to get away for a few days. Most motorcycles can be equipped with a ball hitch, similar to the ones found on pickup trucks and are mounted on the back of the bike. Normally, you don't need to alter your bike as there is factory hitches available for most bikes. If you can't find a hitch for your bike or would like a fancy customized look, then custom hitches are also available. Make sure you buy a trailer hitch that is made specifically for your motorcycle make and model. Buying just any hitch won't do. Take the time to find the right hitch for your bike so you don't have any problems. Not having the proper hitch can damage your bike or your can find yourself in deep trouble. Most motorcycles can't tow more than five hundred pounds. Bikes obviously don't have the same amount of pulling power as a truck and therefore can't haul heavy loads. Because of this, most hitches are designed to handle a maximum of five hundred pounds. Make sure to buy a safety chain that connects the hitch to the trailer. It's a safety measure that shouldn't be ignored. Having a motorcycle trailer hitch on your bike not only allows you to tow a trailer but also gives you the freedom to tow other accessories that will help you do more things with your bike. A conversion signed California SideCar means performance, comfort and safety. If it is to continue your great traveling adventure or initiate you into the world of motorcycles, getting a trike may be the right choice. We offer the most distinguished conversion style on market. You can have your own bike converted or we can provide you a complete trike. Our completely independent suspension is the only one offered on the market. Conscious of the state of our roads, the horizontal shock is a component that will make the difference. You keep ABS brakes and we modify the power track. There are disc brakes on each rear wheels. The taillights make you extremely visible in traffic. The conversion is mostly a straightforward bolt-on operation, without any welding or modification to motorcycle frame or body. 3 years / 80 000 km warranty (parts and labor) is included. .CT-500 All Aluminum Trailer & Frame, Main Page! "Click" above Picture for "More Detailed" pictures! In Internet Explorer, you will see a lock icon in the Security Status bar. The Security Status bar is located on the right side of the Address bar. The certificate that is used to encrypt the connection also contains information about the identity of the website owner or organization. You can click the lock to view the identity of the website.